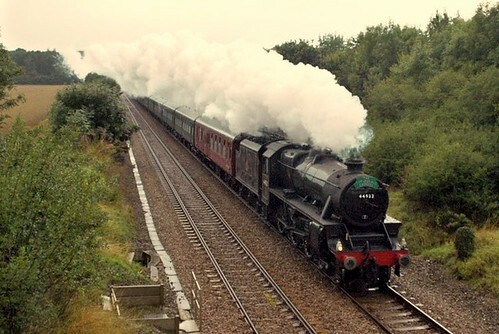 We look forward to welcoming you back in 2012 for another summer of nostalgia, riding behind our steam and electric locomotives. The dates and timings have now been confirmed. The railway and clubhouse will be open from 2:30-5:00pm. Train rides will be available for children and adults(! ), with the last ticket issued at 4:30pm. Refreshments are available in the clubhouse. The WDMES still haven’t been given a firm date for when they need to vacate the site behind the electricity substation on Rochester Way, so they have planned a full year’s events for 2012. 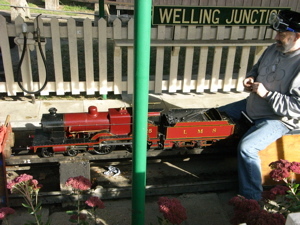 The Falconwood Miniature Railway is very popular with readers of this site. The railway, in its various wordings, is one of the most frequent searches that brings visitors here, attracted no doubt by my predecessor’s sound recording and video of the miniature railway in action. I’ll certainly be visiting one of their public runnings this year, and I’ve added the dates to the site calendar. Last year I uploaded a sound recording of the model railway at falconwood, well now here’s a video to go with it. It was filmed whilst holding on to the driver with one hand and the camera with the other, which looking back on it was probably a bit reckless and could have ended up with me falling into the suspension bridge, but in a way it was worth a bit of a risk. I especially like the bit where we go through the tunnel and you can see the steam on the lens, plus all the friendly bystanders of course. A recent discussion over on plummy mummy’s website, has reawakened my interest in the incredible story of the long (and so far successful) struggle of the residents of south east london against the urban motorway planners that just will not go away: the creators of the dreaded ringway2/elrc/tgb historical trilogy of vastly unpopular road building schemes. In an effort to win favour with the people, the proposal has actually been watered down each time; starting out from a bold 1960’s dream/nightmare of a three carriageway bypass running through oxleas wood, the blueprint was gradually scaled down, ending up with the most recent suggestion that through-traffic could simply drive down residential streets to access the so-called ‘local’ bridge that the tgb was supposedly going to be. Well, thinking back to the state of play in the 1970’s, if you are curious which parts of the area would have been concreted over if ringway2 been built, there is a website that can demonstrate! A motorway enthusiast, who runs an online road directory has painstakingly researched the history of the London Ringways, and has produced an accurate map showing what the route would have been. [click on the image to zoom]. Part x in an occasional series on maps. This little beauty came via the mighty 853, who reported on the forthcoming oysterisation of overground train fares in this neck of the woods. Local stations are now included on arguably one of the all time classic maps, the present day version of the London Underground map, a.k.a the integrated TfL map. As you can see we have the blue line (charing x and canon st), and the green line (victoria) – I would have preferred primary colours myself, but they were all spoken for… I’m not mad on the parallel lines either, as they look a bit hollow, but I’m guessing the designers were trying to differentiate the overground services by tapping in to how people visualise train tracks. Currently: A so called anytime single to London Terminals from zone 4 stations is £3.70, with peak/off-peak returns at £6.20/£4.70 respectively, (for all the confusing details about zone 1 connections, daily cap changes, changes to peak times etc see his pricing post) or the full proposed pricing document. Presently: Comparative trips using oyster fares will cost £3.10/£2.30 (peak/off-peak) single, this is already significantly cheaper than £3.70!). Return prices will vary a bit depending on the time of travel (e.g. the dreaded afternoon peak from 4-7pm), but let’s consider a pleasant scenario for the sake of optimism: a nice little day trip to trafalgar square on a sunny weekend in january, with no onward connections from charing x: this will cost someone over 16 £4.60, which is actually cheaper than current fares by 10 pence. There are various catches that even out the price differences, such as the premium train users pay if they connect with other TfL services in Zone 1, and apparently season ticket holders are going to pay extra, and there are further criticisms of south eastern trains in particular for not going above and beyond the call of duty by making eco-friendly travel to bluewater more accessible (as has been done for lakeside), but overall, it’s good to welcome in these long overdue changes. Well, that’s it for another year of local steam train fun. Sunday was the last public running day on the Falconwood Toy Trains, and it was busier than I’ve ever seen it before – which is understandable considering that Electricité De France, the landowners, might need the land back. Unfortunately a suitable new home has not been arranged as yet, and I get the feeling it’s going to be hard finding somewhere as neatly secluded as the grounds of an electrical substation. The thought of moving must be quite a daunting one, as the track itself is twelve hundred feet long (that’s 386 metres to edf), and that’s before they begin to think about what to do with all the other accumulated steam travel paraphenalia and structures they’ve been adding to the circuit over the last x years, such as the glorious little humpback bridge that takes you over the railway as you enter the enclosure. In my continuing efforts to present a multi-sensory hill experience I have added a recording of a ride around the track to accompany the photo, and short of coming round to your house and starting a coal fire in front of your armchair and spraying you with steam, I think it goes some way towards reflecting the moment, I deliberately didn’t use video, as sound leaves a bit more to the imagination.